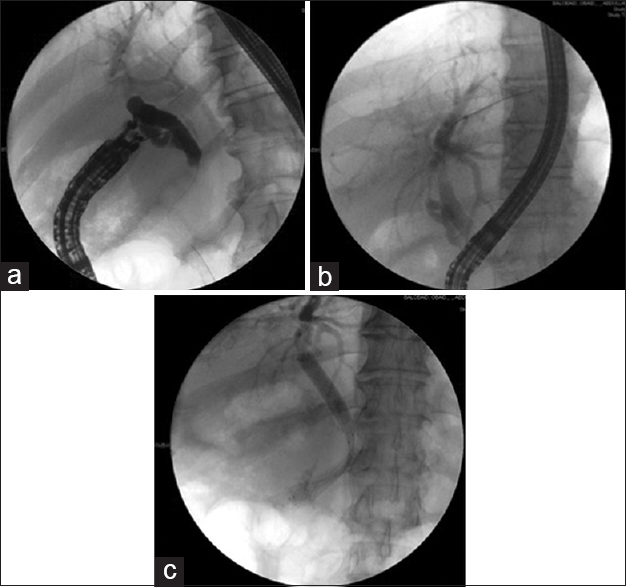 Although endoscopic retrograde cholangiopancreatography (ERCP) remains the gold standard method to achieve biliary drainage (BD) in cases of obstruction, some situations preclude this option. Alternatively, percutaneous BD is associated with a number of limitations and more recently associated risks have been found to be higher than those with nonconventional interventions such as endoscopic ultrasound-guided BD (EUS-BD). EUS-BD encompasses a number of interventions and approaches depending on the underlying cause and position of obstruction. We present a case series of six cases where EUS-BD was used when ERCP was not possible or failed at a tertiary care academic center. We also describe the different types of EUS-BD based on the nomenclature that has been proposed by the Asian EUS group (AEG). In all the cases that were presented, EUS-BD was successful with no complications or adverse events. The intervention resulted in resolution of biliary obstruction and the patients underwent the planned treatment for their underlying disease. In this case series, we introduced the concept of EUS-BD to the nonspecialist and illustrated the variability of the procedure and its agile nature when applied in the right setting and with the proper expertise and the importance of the presence a complete team approach by different specialists when caring for these patients. Not uncommonly health-care providers encounter patients with biliary obstruction from numerous causes whether they are benign or malignant. Conventionally, endoscopic retrograde cholangiopancreatography (ERCP) can achieve biliary drainage (BD) in more than 90% of cases. There remains of proportion of patients where ERCP cannot achieve biliary access due to technical difficulties or, at times, the duodenoscope cannot reach the opening of the biliary system into the gastrointestinal track, either due to altered anatomy from a tumor precluding reaching the papilla or due to surgically altered anatomy, for example, in cases of like Roux-en-Y surgery, Billroth II procedures, bariatric bypass surgeries, or biliopancreatic diversion. 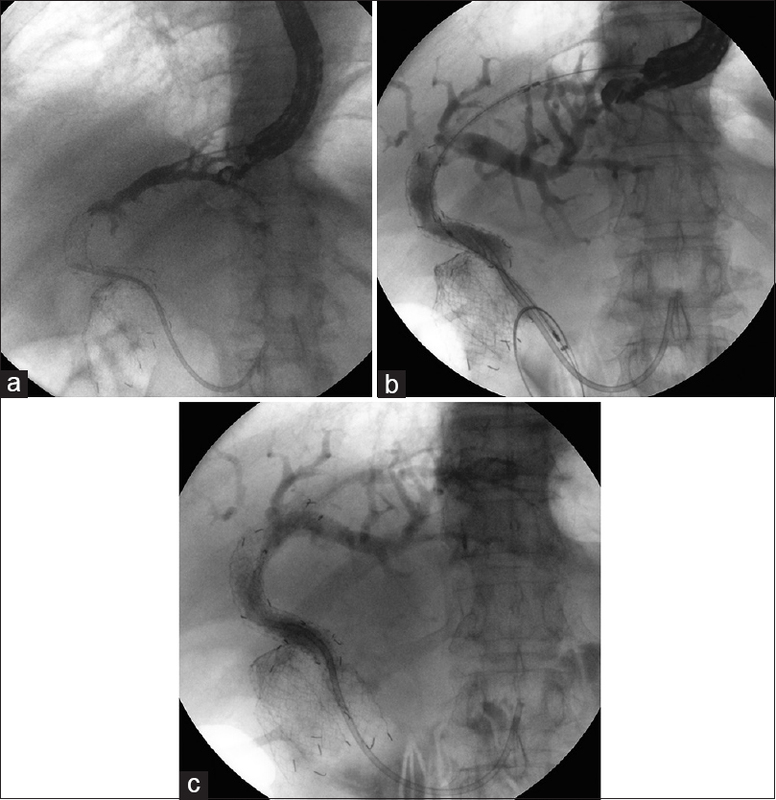 In such cases, the classical approach was inserting a percutaneous biliary drain (PBD). These PBDs require multiple sessions for their insertion, as well having the disadvantage of an external tube that requires care and frequent flushing so as to not get obstructed. A more recent approach has been to utilize endoscopic ultrasound (EUS) to facilitate the insertion of a guide wire after puncturing the liver through the stomach or the common bile duct (CBD) through the duodenum and utilizing that wire to facilitate access through the normal method of an ERCP which has been coined EUS-guided rendezvous technique (EUS-RV). Another method to achieve BD has been the direct insertion of stents, whether plastic or metal, through the EUS scope directly into the biliary system, which has been designated as EUS-BD  [Figure 1]. Of note, all of these procedures are performed under fluoroscopic guidance and require expertise in EUS as well as proper backup from interventional radiology as well as surgery if needed. 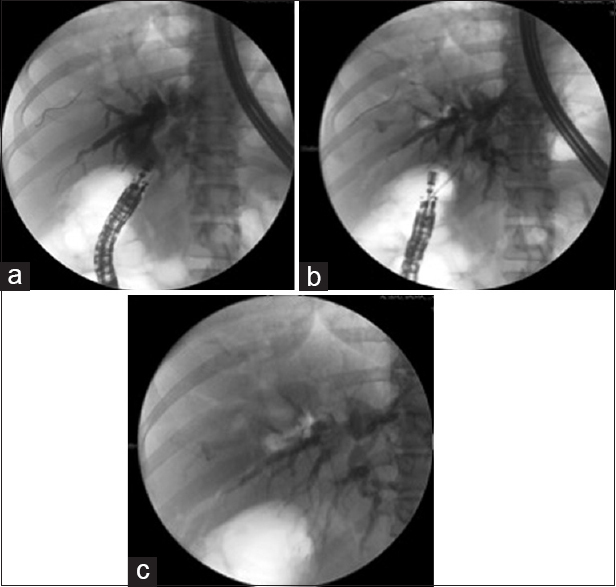 A 78-year-old male who was diagnosed to have cholangiocarcinoma of the biliary system and who already underwent prior ERCPs with the insertion of self-expandable metal stents (SEMS) in the CBD and latter plastic stents due to recurrent obstruction. After a few months from his last endoscopy, he presented with recurrent biliary obstruction and nausea and vomiting. He was found to have gastric outlet obstruction due to the mass encroaching on the duodenum. After the insertion of a duodenal stent, the papilla could not be reached due to the potential compromise to the freshly inserted duodenal SEMS. An EUS-AG was performed the EUS scope was introduced into the stomach, and the left lobe of the liver was punctured from the stomach and contrast was inserted into the biliary tree to confirm the correct positioning of the needle [Figure 2a]. After that, a wire was advanced through the needle from the periphery of the liver to the left hepatic duct and then the CBD and into the duodenum through the prior placed stents. An uncovered SEMS was inserted then through the stomach wall into the CBD and positioned in a fashion that the proximal end was in the biliary system while the distal end was in the duodenum [Figure 2b]. The patient's symptoms resolved and his managing oncologist resumed his care  [Figure 2c]. A 71-year-old male who was known to have Type II diabetes and hypertension presented with vague abdominal pain associated with nausea and weight loss over the span of a few weeks, the examination did not demonstrate any abnormal findings apart from jaundice. His laboratory investigations demonstrated an elevated alanine transaminase (ALT) 153 units/L, aspartate aminotransferase (AST) of 66 units/L, alkaline phosphatase (ALP) 247 units/L, as well as a total bilirubin level above 200 μmol/L and a direct bilirubin level of 153 μmol/L. A computerized tomography (CT) demonstrated a hypoechoic mass at the head of the pancreas measuring 4 cm by 4 cm and invading the portal confluence as well as the superior mesenteric vein with numerous peripancreatic and porta hepatis lymph nodes as well as dilatation of the pancreatic duct to 7 mm. An EUS fine-needle aspiration confirmed the diagnosis of pancreatic ductal adenocarcinoma. An ERCP failed to achieve cannulation, and a EUS-RV was performed after puncturing the CBD from the duodenum into the dilated CBD [Figure 3a] and advancing a wire till it passed through the papilla. The EUS scope was then withdrawn while keeping the wire in place using an exchange technique and then a regular duodenoscope was inserted and the guidewire was grasped using a snare and cannulation was achieved with a sphincterotomy [Figure 3b] and an uncovered SEMS was inserted with good BD [Figure 3c]. A 48-year-old female present with epigastric pain and vomiting associated with progressive deep jaundice and dark urine as well as pale stools. Her initial investigations demonstrated an elevated AST (79 units/L), ALT (128 units/L), ALP (989 units/L), and a total bilirubin level of 300 μmol/L that was mainly direct. A CT scan demonstration metastatic pancreatic cancer which was confirmed by a tissue biopsy. An ERCP failed to achieve biliary cannulation, so we proceeded to EUS-RV but was unsuccessful due to failure to advance the ERCP scope to the papilla despite initially succeeding in passing a wire through the duodenum to the CBD and out of the papilla. Hence, the scopes were withdrawn, and an EUS-CDS was planned. The EUS scope was advanced to the duodenum, and the CBD was punctured with a needle and a guidewire was advanced from the mid-CBD to the intrahepatic ducts in a retrograde fashion after confirming correct position of the needle by injecting contrast [Figure 4a]. A specially designed partially covered SEMS was used and inserted into the biliary system in an orientation where the proximal end of the stent was in the common hepatic duct while the distal part of the stent traversed the duodenal wall and into the duodenal lumen above the duodenum [Figure 4b]. BD was successful [Figure 4c]. An 84-year-old female was admitted with progressive feelings discoloration of the eyes, itching, and right upper quadrant pain associated with dark urine. Here, laboratory investigations demonstrated elevated liver enzymes and high total bilirubin that was mainly to direct. A CT scan of the abdomen demonstrated a large right hepatic lobe mass that either represented a cholangiocarcinoma or gallbladder cancer. Given the patient's advanced age and multiple comorbidities, a palliative BD procedure was planned without obtaining a tissue biopsy. The duodenoscope could not be advanced to the papilla due to distortion of the anatomy from the tumor, so a EUS-hepaticogastrostomy was planned. An EUS scope was advanced to the proximal part of the stomach and under EUS ultrasound guidance a needle was introduced through the stomach and into the left lobe of the liver. After confirming correct position of the EUS needle by injecting contrast into the biliary tree [Figure 5a] a specially designed partially covered SEMS was is inserted so that the proximal part would be in the left intrahepatic biliary tree while the distal portion was in the stomach [Figure 5b]. The patient's symptoms resolved and underwent palliative care. A 76-year-old female who was recently diagnosed with gallbladder cancer presented with right upper quadrant abdominal pain and jaundice. Her liver enzymes were elevated as well as her total bilirubin that was mainly direct. CT scan of the afternoon and re-demonstrated the mass in the gallbladder bed only this time associated with intrahepatic biliary dilatation with a transition zone at the level of the common hepatic duct. An ERCP failed due to difficult cannulation, so an EUS-AG was performed in a similar fashion to the one described earlier and achieved biliary decompression with no complications. A 54-year-old male who was known to have metastatic colon cancer and underwent surgery for the primary tumor as well as liver resection for a metastatic lesion as well as a hepaticojejunostomy and chemotherapy presented with abdominal pain and jaundice. A CT scan demonstrated biliary obstruction at the hepaticojejunostomy site as well as multiple liver metastasis. Due to the difficulty anticipated in reaching the hepaticojejunostomy site with a duodenoscope an EUS-AG was performed where an uncovered SEMS was inserted through the stomach and the stent was positioned from the left hepatic duct and traversed the hepaticojejunostomy [Figure 6a] and [Figure 6b] with good BD. EUS-guided biliary interventions are a new application that provides alternative options to patients who are usually undergoing palliative care. Minimizing complications, maximizing comfort and improving the quality of life are usually of paramount importance when caring for these patients. The cases as described in [Table 1] demonstrate how this intervention could be agile as well as provide an alternative to the conventional PBD that usually hampers the quality of life of patients and not uncommonly results in recurrent admissions due to tube dysfunction. Results of studies that include more than 50 patients report a success rate that exceeds 90%, which is higher than those reported in smaller series. Furthermore, complication rates are around 19%, these include bleeding, cholangitis, perforation, bile leaks, pancreatitis, stent migration, and rarely death. Less serious complications include pneumoperitoneum, stent occlusion, and guidewire sheering and retention. Although this might be an attractive option to achieve biliary drainage, it remains as a second-line therapy after attempted ERCP. This is due to the fact that expertise with these procedures is still limited and they do require proper backup with interventional radiology as well as surgery for any potential complications. Other challenges associated with this procedure is there are still limited accessories that have been developed for this procedure specifically as well as the lack of training in the procedure as these are still being performed in high volume specialized centers. To add to that fact, centers that have this expertise also usually have a high success rate in achieving BD with ERCP even in difficult cases thus limiting the pool of patients that would qualify for such an intervention. When the expertise is available in a center, this option should be offered to patients who fail ERCP, and there are trials at the moment comparing these EUS-guided interventions to PBD as well as percutaneous gallbladder drainage. Adler DG, Lieb JG 2nd, Cohen J, Pike IM, Park WG, Rizk MK, et al. Quality indicators for ERCP. Am J Gastroenterol 2015;110:91-101. Almadi MA, Pausawasdi N, Ratanchuek T, Yuen Bun Teoh A, Yu Ho K, Dhir V. Endoscopic ultrasound-guided biliary drainage. Gastrointest Interv 2016;5:203-11. Dhir V, Isayama H, Itoi T, Almadi M, Siripun A, Teoh AY, et al. Endoscopic ultrasonography-guided biliary and pancreatic duct interventions. Dig Endosc 2017;29:472-85. Almadi MA, Eltayeb M, Thaniah S. Endoscopic ultrasound-guided antegrade stenting in an occluded biliary self-expandable metal stent. Saudi J Gastroenterol 2016;22:337-40.